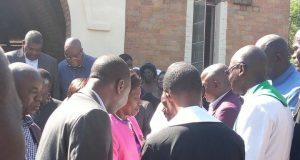 Home / Synod News / Bishop Thuma Hamukang’gandu Counsels UCZ Newly Ordained and Commissioned Church Workers. Bishop Thuma Hamukang’gandu Counsels UCZ Newly Ordained and Commissioned Church Workers. KABWE – 19/04/2015: The United Church of Zambia Synod that constituted as the United Church of Zambia on 19th April 2015 at UCZ St Peter’s Congregation for the sole purpose of ordaining ministers and commissioning diaconal workers witnessed the setting apart of 10 church workers (3 diaconals and 7 clergy) to their various ministries. This solemn occasion was officiated by His Grace the Synod Bishop, the Right Rev Mutale Mulumbwa and the General Secretary, the Right Rev Dr Mulambya Kabonde of the United Church of Zambia. In attendance also were Board of Trustees Mr Chipeta and Justice Lloyd Siame , Presbytery Bishops Rev Manyando Lubinda(Western), Rev Akabana Mutanuka( Southern), Rev Martha Kapambwe Siame( Eastern), Rev Georgina Mukupa Ezerioha( Central), Rev Samuel Mwambazi( Luapula), Rev Christopher Yamba(Copperbelt), Rev David Mujumila(North-western), Rev Chayana Nkonde( Northern), Rev Frank Bwalya(Muchinga), Rev Kamuya Munjita( Former), Rev Fammy Silungwe (Former). Also in attendance were Synod Heads of departments Mr Keith Waddell ( education), Dr Alex Simwanza ( Health), Mr Bornface Mafwela( Projects & CDSJ), Mr Innocent Kangwa( Finance), Mr Chewe( Internal Auditor), Mr Paul Samba, (Chipembi Col of Agric), Rev Kapembwa Kondolo(UCZ University Col), Rev Dr Richard Mupepa Chimfwembe( MES),Rev Mary Mwiche (UCZUC Academic dean), Mr Rogers Ng’ambi ( Admin Sec), Rev Dennis Mbita Sikazwe(Comm Sec), Patrick Nkama ( Advisor to G,S & SB), Mrs Victoria Silutongwe(Advisor to G,S & SB ), Mr Hastings Chiti( Synod Fundraising Committee Chairperson), Mr Andrew Muwowo( Synod Fundraising Committee member), Mr Muchelemba( Synod Fundraising Committee member) Mr Chabala( Synod Fundraising Committee member) and the delegates of the Synod Executive Meeting that was sitting from 19 – 20 April 2015. Deaconess Gloria Chomba, Deaconess Chisanga Chella and Deaconess Sharlotte Nakazwe Chisenga where admitted into the commissioned diaconal ministry, while Licentiate Probationers Justine Manda (Eastern), Harriet Kapeya (Lusaka), Martin Sakala (Northern). Donaldson Bwalya (North-western), Nebby Chanda (North-western), Chilongo Mwenya Hamwiinga (North-western) and Josphat Sinkala (Western) were admitted into holy orders of ordained ministry of the Word and Sacraments. In her welcoming remarks the General Secretary stated that the United Church of Zambia strongly believes in the unity of all believers and has since in 2015 demonstrated this by inviting the presiding Bishop for the Brethren in Christ Church from Choma and a Guest preacher. Speaking at the solemn occasion Bishop Thuma Hamukang’gandu counselled the newly admitted Church workers that they needed both good and bad people in the church because they help us see things differently, and he further reminded them that leadership is an isolated role. The readings came from 1 Chronicles 22:1-16 and Acts 6:1-7. 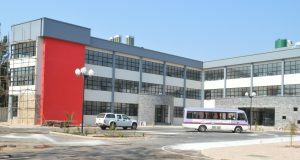 The United Church of Zambia has since 1949 (66 years now) been training its church workers at the UCZ University College at Mindolo in Kitwe. The training of an ordained Minister in the United Church of Zambia takes 5 years broken in two parts, thus 3 years of full-time academic engagement at the University, and 2 years of combined academic and practical experience (known as probation period). During probation period a student operates with a licence leading to ordination. A minister is put under a senior minister who supervises and mentors the student; assignments are sent from the University to each student. These assignments are graded and assessed every year for the purposes of progression into another year. The academic and practical assessment of each student determines qualification for ordination. The diaconal workers’ training takes 3 years also broken into two parts – 2 years of academic engagement and one year probation period. A recognition service is held after 2 years of training leading to commissioning. The ordination and commissioning of these 10 church workers therefore marks the end of their attachment to the University College and their subsequent ecclesiastical admission into their various callings. 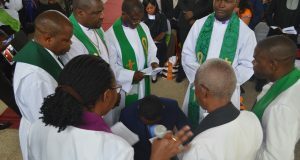 The Rector of the UCZ University College Rev Kapembwa Kondolo administered the sacrament of Holy Communion. The whole service was characterised by joyous songs and praises by choirs.